You guys know how much I love my interesting beverages. When I’m not infusing my water, I’m drinking coconut sparkling La Croix or Suja Lavenade. I just really love trying interesting, unique beverages – especially if they’re healthy. This freak beverage-obsession saga continued onto a new chapter when I was leaving Equinox a week ago, and realized I hadn’t eaten dinner and it was already 9pm (whoops). Sometimes I get stuck in the locker room because the showers are so nice and there’s so much kiehl’s and there’s a steam room and and and OK I’m stopping now. So I headed to Earth Bar on my way out, and saw some beautifully packaged cold pressed almond milks. “PRETTY!” I thought. Second thought was “PROTEIN!” So I grabbed one. $6. A bit pricey, but not bad for something that is so healthy, high-quality, natural and nutritious. I’m a sucker for quality. I looked at the ingredient list and assured myself of my savvy purchase decision. I don’t remember much of what happened next – it was all a blur of euphoria, and about 42 seconds later, I was somewhere on Sansome Street with an empty bottle in hand. WHO JUST DRANK MY ALMOND MILK!? I was immediately hooked. Over the course of the next few days, I couldn’t leave Equinox without grabbing one. 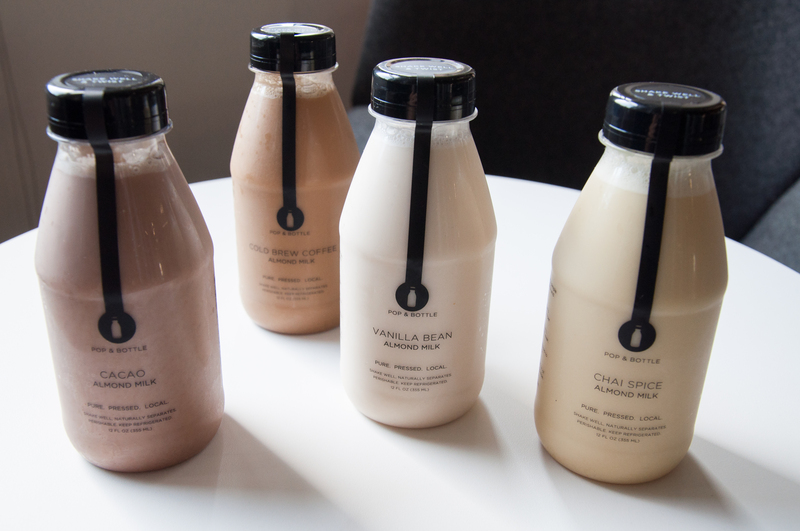 Vanilla Bean Cold Pressed Almond Milk from Pop & Bottle had become my drug of choice, and it was an expensive habit. Then I saw them at Whole Foods, and it seemed as though this little brand was following me. I wasn’t mad, though. I wanted the world to know of my new, unencumbered love. My obsessive tweeting and oversharing on social media led me to a connection with the co-founders of the SF-based company. I was beyond excited to learn more about the local brand, and what they were doing to make these unimaginably delicious, fresh drinks. The amazing people at Pop & Bottle let me try all the flavors (holy s***), so I’m gonna review them all for you! (if you don’t care for the details, the summary is THEY’RE ALL MAGICAL). So the four flavors on offer are Cacao, Cold Brew Coffee, Vanilla Bean, and Chai Spice. 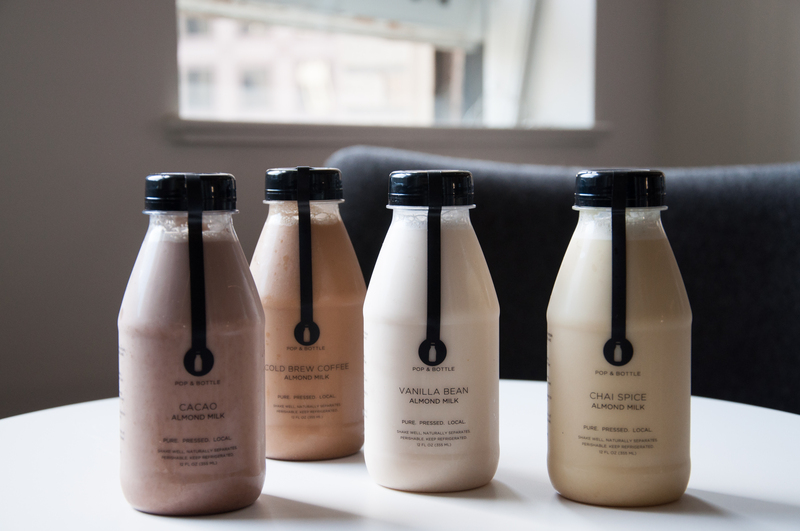 The cacao is a sweet, chocolatey, refreshing take on a chocolate milk, yet still maintains all the creaminess of its dairy-based cousin. As for the coffee, while I’m not a huge coffee-drinker (especially because I get caffeine headaches pretty easily), this smooth, cold-pressed blend didn’t make me feel jittery, and I didn’t experience a caffeine crash, either. As you may have noticed, the Vanilla is my favorite; it’s such a perfect on-the-go, filling drink, and you can really taste the vanilla bean. The chai is incredible, and uses organic cinnamon, turmeric and cardamom to create a tea-inspired flavor. With no added sugar, all the sweetness comes from organic, medjool dates – but you’d never guess it, based on the consistency of the drinks. It’s light, silky smooth, and not at all viscous. The result is a lightly sweet, smooth and refreshing beverage that fills you up without weighing on your stomach. You can try them yourself at the Ferry Building, all the SF Equinox locations, some SF Whole Foods locations, and a handful of different places in the Bay area. If you’re in the SF area, give these guys a try and let me know if you’re as obsessed as I am. Thank you to Pop And Bottle for sponsoring this post! V V IMPORTANT: my fav swimwear is now available in the US!